You already know that at Spanish and Surf in Fuerteventura you’ll discover the absolute best way to learn Spanish while learning to ride the waves like a surfing master! But, as far as outdoor sports go, Fuerteventura has so much more to offer that I would be amiss if I didn’t mention some of them on to you. So lets take a break from Spanish school and get out the water for a moment, and let me talk to you about one of my passions… hiking! While Hiking in Fuerteventura has become, in recent times, an alternative to sun and beach based tourism. The island provides more than 255 kilometers of hiking trails, all of which offer different and unique views of the island! Fuerteventura has 21 different trails, which are distributed throughout all of the island’s geography, and for which the Insular Network of Trails has been responsible for signaling and conditioning. The island has several short trails (PR-FV) and local trails (SL-FV), that are appropriately equipped for hikers. But there’s no doubt that the crown jewel of hiking in Fuerteventura is one of the sectors of La Gran Ruta 131 (GR-131), which is part of an internationally recognized hiking trail that currently crosses the islands of Tenerife, La Palma, El Hierro, as well as Fuerteventura in its entirety, from north to south, from Corralejo to Punta de Jandía, including the island of Lobos, and which is done in several stages. New stages in La Gomera and Lanzarote are expected to be added in the near future. Over the following couple of months I’ll be posting a five part series describing the different stages in the Fuerteventura sector of La Gran Ruta 131 hiking trail. Starting with this post, where I’ll be touching on the island of Lobos stage, the following instalments will each touch on two new stages of the trail, for a total of 9 stages. This route crosses the island of Lobos from south to north, from the pier to the Martiño lighthouse. 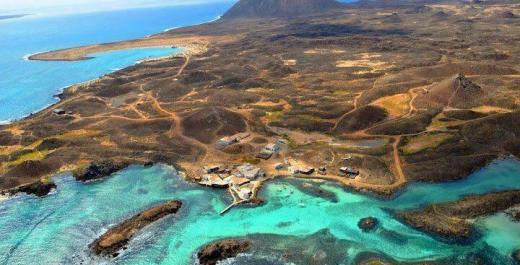 The “Camino Natural” (Natural Way) traverses the island of Lobos, a small islete located just two kilometres north-east of Fuerteventura and which was once inhabited by monk seals, from which Lobos gets its name (sea wolves). 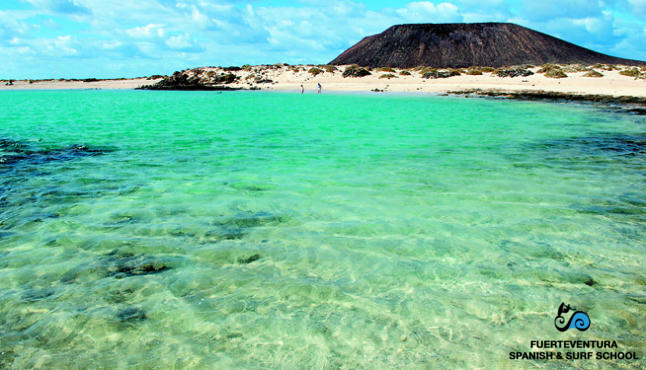 To get to the island we must take a short ferry from the northern town of Corralejo. The route starts right at the pier in Lobos, called El Muelle (the dock), which is where the ferry from Corralejo will arrive at. To start the stage, we take the path north until we reach the beach of La Concha (seashell), popularly known by this name because of its shape, although its actual name is Calera Beach, for the lime kiln which is located there and which was used in the construction of the Martiño lighthouse. Continuing the road northward, we pass through an intersection from which there is a trail that leads towards the saltworks of Marrajo. At this point we will cross areas with different variants of endemic shrubbery, like the sweet tabaiba and the aulaga. We keep to the left of the mountain of La Caldera, a volcanic cone whose peak lies 127 meters above sea level. After the junction with the trail leading to La Caldera, we can see on the left the “Llano de los Labrantes” (Plain of the Stone Cutters), where the Portuguese workers who built the lighthouse had settled in 1860, and where there one can still find remnants of their dry stone huts. Next up, the trail passes between the Morro (hill) de Las Pilas and Morro Escarchado, always surrounded by the characteristic vegetation of the island. We then pass Morro Colorado, where we can already glimpse the lighthouse on Mount Martiño and the end of the path, but not before passing by the lighthouse’s salt marsh. Before climbing Mount Martiño to the lighthouse, there is a junction where we have the option to return to the dock by the same path or take another path that runs along the island from north to south on the east side.